How have you enjoyed God’s light in your life? How does your perspective change as the quality and position of the light around you changes? How does God’s light differ from lights of the world? Light is beautiful. It creates beautiful patterns in our lives. It illuminates the reality of a situation. Without it, we cannot see. And without accepting God’s grace, we cannot live it out. We try to prove ourselves, take control, and establish and maintain self-sufficiency. It’s not going to happen, because God is the source of proof, control, and sufficiency. God doesn’t just provide us with light; he is light. We don’t just find God in light. We find light in God. We experience God when we’re living in his light. The two can’t be separated. The same is true with grace. God’s grace cannot be separated from him. It’s who he is. Live It. Stand in the light. Look around you and see how the light impacts what you see and how you see it. Change your perspective, turning your body or taking a step into or away from the light. Pay attention how the changes you make impact your perspective. The light doesn’t change. Your perspective changes based on where you are in relation to the light. Where you are in relation to the light always makes a difference in what you see and how you see it. Consider how your experience impacts your relationship with God and your commitment to seek and stay in his light. Bluebells don’t look beautiful or bloom for long, but they are perennials. They may look like they die back and are gone, but given the right conditions, they’ll blossom again and prove they are still around and worthy to savor. They’re best enjoyed in their natural habitat, because they won’t last long once you remove them from their life source. They remind me of a life of faith. It’s beautiful and noteworthy when it blooms, yet it doesn’t always display it’s colors. It endures through seasons as long as it remains attached to their life source. What is something you have left in the past? What is something you are anticipating for your future? Tracing is difficult. You must start with a pattern and follow it closely. The same is true with restoration. You’re trying to recreate something. You don’t want to betray the original. The same is true with us. 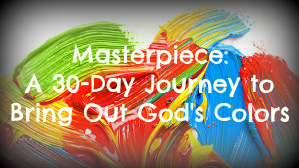 We are God’s masterpieces, but in order to become more like Him, we have to know Him. It’s a process. We’re constantly uncovering, tracing, and restoring who we believe He is and, therefore, who He created us to be. We were created in His image, and He is constantly transforming us. But we have to focus, not because we’re responsible for the work. God does the work of transformation. But our job is essential to the process. We have to yield. We have to pay attention, listen to His instruction, watch for the fulfillment of His promises. He wants us to become, and that takes time, effort, humility, and willingness. You don’t have to live up to the standard of who God will transform you into someday. Stop comparing yourself to who you can or should become. You’re not there yet. You’re not prepared for that step. If you focus too much into the future, you miss out on the step God wants you to take today. You miss out on the preparation He has planned for you, the preparation that will lead you where you need to be and give you what you need when you reach each of your tomorrows. Let God take care of assessing your life. He has the best vantage point. He is the original artist, so He’s the best possible option to restore you into the masterpiece He has planned. Write as many words that describe God as you can. You can include names or adjectives, anything that reveals who He is. Write for at least one minute. Knowing God better helps you trust Him more. Knowing Him better helps you know Him better. Knowing Him better challenges you to rely on Him as He transforms you into His masterpiece. What questions do you most want to ask God? When have you found an unmet need when and where you least expected it? I was at a women’s event, talking with a friend in the foyer during a midday main session. No one was expected to arrive so late, so my friend and I were surprised when a woman walked through the door. Her name was Olga. She was looking for a cup of coffee. There was a coffee shop in the building, but it was closed for the day. Since we had coffee prepared for the event, sharing a cup of coffee was no problem. Other than looking for a coffee shop, Olga knew nothing about where she was. She began to ask questions about the purpose of the building and our event. As it turned out, she was new to the area and had some needs that available specific ministries could address. After talking for a while, I asked for her contact information, and she left. Unless we know the need, we can’t meet it. We have to ask questions. Sometimes we don’t ask direct questions. Sometimes the person in need doesn’t even know the need. How can we? We can interact. Listen. There are often unexpressed, even unidentified, needs just under the surface. A sip of coffee didn’t fix Olga’s longing for healthy community of support and accountability, but it was a start. We did what we could. She got a cup of coffee for free, plus a conversation. In that moment, her needs were met beyond expectations. That’s what happens when we ask questions of others and ourselves. We don’t have all the answers. It’s okay when all the pieces don’t fit as we think they should. We might be able to help another person with one piece of her puzzle and someone else helps with another piece. Likewise, many people in our lives help us with our needs—both identifying and meeting them. Ask the questions. Trust God for the answers. Look for someone to help today. Don’t help them on your own terms and timing. Help them on theirs. Keep it simple. Even the smallest acts of service and kindness impact people’s lives in big ways. Who has encouraged you recently? Who have you encouraged lately? How has God surprised you with unexpected encouragers and encouragement? Some people are colorers. They color people no matter where they go. They encourage people, share a smile, teach a timely lesson, infuse encouragement, extend accountability with compassion, invest in others’ lives, and anything else they can do to put color into people’s lives. How can you color others’ lives? Listen. It’s a simple, but sadly, not-so-common practice. People need to share. Invite them to do so. Compliment. I’m not referring to someone’s new shoes or hairstyle. Find a characteristic or action you respect, and let her know you noticed. Invite. Whether it’s an invitation to serve, have coffee, or step in front of you in line, extending an invitation helps someone see you’re paying attention. Smile. A warm smile goes a long way. Look for someone with a downcast or preoccupied expression. Make eye contact and share a smile. Share. Let someone sit in the empty chair at your table or pay for coffee for the woman behind you in line. Sharing your life with someone begins with making space. Pause. Interact with the cashier or barista. Ask the receptionist a question. Wish the salesperson well. The words you share (or don’t) aren’t just about you. Consider how the person to whom you’re speaking will receive them. Challenge. Sometimes the best encouragement is a challenge to live by God’s standards. Encouragement isn’t about making someone feel great; it’s about helping them walk a life of great faith. Rely on God’s courage and direction to say the right thing at the right time. See how many times you can repeat one or all of the above ideas. Be a people-colorer today. In fact, become a lifetime people-colorer. What are some purposes of masks? What masks are most obvious to you when others wear them? What masks are you most likely to wear? Masquerade, theatrical, pampering, scuba, surgical, tribal, Halloween, sleep…and the list goes on. Masks are most generally used to give the illusion of being something we’re not, for protection, or to hide. Taking off our masks make us feel uncomfortable, exposed. When we take off our protective masks, we’re sensitive. We feel exposed. Our skin, our hearts, are soft. But God will never leave you exposed without His protection. You may not feel protected and safe, but our feelings deceive us. The reality is God will never leave us. God gives us guidance, comfort, peace, and discernment through the Holy Spirit, who fills us. Isn’t it wonderful to know that God doesn’t just watch us from heaven? He doesn’t even just stay by our side. He fills us! That means we don’t need our own strength. We don’t need our own courage, protection, or direction. What we need is open ears to hear and willing hearts to obey. God has given us all we need. When we mask ourselves, we may hide a piece of ourselves for safety, but we also hiding the Holy Spirit, who lives in us. When we mask ourselves, we might cover up a few flaws, but we also deflect what we want to receive. When we wear a mask in order to receive approval, love, or respect, those things hit the mask, not us. We don’t get the full blessings of receiving what we most want. The mask that was supposed to help us actually ends up protecting us from the very things we want or need. Write the following two verses on index cards or sticky notes and post them where you’ll see them throughout the day. Reread and claim them, especially when you’re tempted to wear a mask.